Mofo Gasy means "Malagasy bread" , is a traditional breakfast from the Madagascar ,the large island off the south east coast of Africa. It's also a common street food served as breakfast along with coffee/tea. Lightly sweetened yeasted batter pour into circular molds(like our paniyaram pan) and cook on medium flame until it became crispy on both sides.It has quite different variations in the making across the Madagascar region based on the usage of coconut milk & flavoring agents. Take the flour, semolina, sugar,salt & yeast in a bowl, mix it well and then add the lukewarm water. Mix it all well together. Cover the bowl with the cling wrap and let it rest for 3-4 hrs. After 4 hrs, the batter should have bubbles all over and risen a bit. Now remove the cling wrap and mix the batter with the ladle, add the condensed milk. Mix it all well together. Heat the paniyaram pan, add few drop of oil in each hole and let it heat, then pour the batter into each hole. Let it cook for 2-3 mins in medium flame. Gently flip them with the wooden stick and cook on the other side also for 2-3 mins and then remove it from the pan. Mofo Gasy/ Malagsasy Bread is ready. Serve it with coffee or tea. The batter is so soft, so it's really tricky to flip the pancake on to the other side. Highly recommend to use non sticky pan and grease it generously. Instead of condensed milk, you can use whole sugar itself, it may need 5 tbsp of sugar. Condensed milk gives richness to the dish. I haven't used any flavoring agent, but if you want add 1/2 tsp of vanilla extract. Cook in low flame, otherwise it would get darken very quickly. If you don't have enough time in the morning,make the batter on previous night and keep it in the refrigerator for overnight, so the batter will be all fermented and ready for morning breakfast. Wow! Addition of condensed milk an yeast would have changed the flavor and texture. They look beautiful. Thanks Harini.Yes, yeast has that power!!! Wow. Its completely new for me.. interesting option for breakfast. Wow that looks like a new version of our paniyaram. Never made anything like this with yeast. Am sure the texture would have been great! Yes PJ, it was really good !!! Interesting breakfast ! Videshi recipe desi style ! The bread looks cute , and looks very soft pillowy kinds . Great option to cook in a paniyaram mould . Videshi recipe desi style, yep, you're so correct, Vaishali. It's actually interesting to know how the same ingredients are used different in every other cuisine!!! wow such an interesting recipe sandhiya :) these do remind me of rava paniyaram , They are so well browned and looks gorgeous , am loving the fluffiness of these mofo gasy :) I am trying to pronounce these as it is too tough for me to get the right pronunciations :D with condensed milk is in them these fluffies look addictive :) Wonderful recipe from you again !! Same here Manjula, i'm trying to pronounce these for a while :-) Thanks, condensed milk gives richness to this bread !!! Yeast has that power to change the entire texture and feel right? I love what vaishali said... Videshi recipe desi style... lol. Namma enipu paniyaram but with condensed milk and all that stuff. But great find Sandhiya. Thanks Vidhya. Yeah, you are so right about yeast !!! 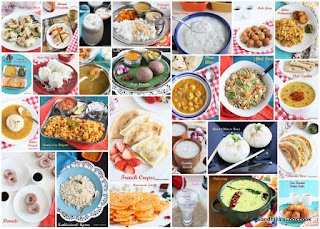 Sometimes i really amazed by how close the recipes are across the world !!! Nice find..I feel like a Yeasted Kuzhipaniyaram .Lovely and delicious share.. Yes, it sounds like yeasted paniyaram, but the taste and texture are so different, Sharmila. Feel like munching some, and this malagasy bread looks absolutley cute and soft with pillowy effort. Excellent breakfast. Love these fluffy, soft and yeasty pancakes. I made these a few years back and absolutely loved them. You are tempting me to try them some time soon. Me too like it very much,Pavani. The soft and tasty pancakes with semolina looks absolutely delicious. They look just like the sweet paniyaram and would make a wonderful breakfast. Yes Sapana, it's kind of look like sweet paniyaram but the taste is totally different. I like anything and everything paniyaram and this would be no exception. I am definitely bookmarking this version as my little one love sweet paniyaram. He would absolutely be delighted to eat this for breakfast! It is interesting to know there are so many dishes like paniyaram all over the world. This yeasted version looks so soft and absolutely yum. You are right, there are so many version around the world!! Nice idea to use Paniyaram pan. With condensed milk I think this will be reach. What a beautiful dish Sandhiya, I have something coming from madagascar and can't wait to read about this dish and make it too! Thanks Valli. Looking forward to your recipe !!! That's one interesting breakfast. Isn't it amazing how so many dishes all around the world are so similar except for a difference or one or two ingredients. Yeah, i'm too amazed ,Mayuri !! Love the name! Looks very similar to our paniyaram! Soft pillowy texture mildly sweet must be a lovely breakie for a relaxed weekend! I too love the name, Priya. yeah, i looks like out paniyaram. Addition of condensed milk sounds interesting here and the bread puffs sound delicious..
My daughter doesn't like the traditional south Indian version paniyaram. I am hoping that she may like them. I am going to try them for her.